What Is the Russian Attitude Towards Religion? Before you begin working your way to foreign language fluency, it helps to understand the culture behind the language you’re learning. After all, language exists to help a group of people express their ideas and beliefs. Russia is a vast country with a rich history and culture. As you begin your Russian language program, gaining a strong grasp on this history, the values, and the etiquette will help you rapidly achieve success. In particular, Russians have a long history with the Russian Orthodox Church. Russia formally accepted Christianity in 988. This conversion was lead by Vladimir the Great (ВладимирВеликий), who reigned Kievan Rus’ (КиевскаяРусь) from 980 – 1015; he sent warriors and Orthodox priests to baptize Novgorod and break local Slavs of their historical pagan religions. For over a thousand years the Russian Orthodox Church played an important role in Russian history. It united the Russian princes in the age of feudal strife; it gave the people comfort at the time of the Tatar invasions; it developed art, blessed soldiers before battles, and fostered education. During the Soviet era, church icons were replaced by portraits of Marx and Lenin, with the later addition of Stalin and other leaders. The Commandments were carefully woven into the “Моральныйкодексстроителякоммунизма”(“Moral Code of the Builder of Communism.”) The values of the Russian Orthodox Church—patience, humility, and mutual assistance—were ideally suited for the hardworking collectives of the “строителикоммунизма”(“builders of Communism”). The collapse of the Soviet Union and the discrediting of Soviet ideology created a vacuum of faith: if there were to be no Communist paradise ahead, what could people believe in? At first the vacuum was filled by numerous American sects, and by magicians and con artists claiming enormous extrasensory powers; but by the middle of the 1990s the majority of the population had turned to Orthodox Christianity. 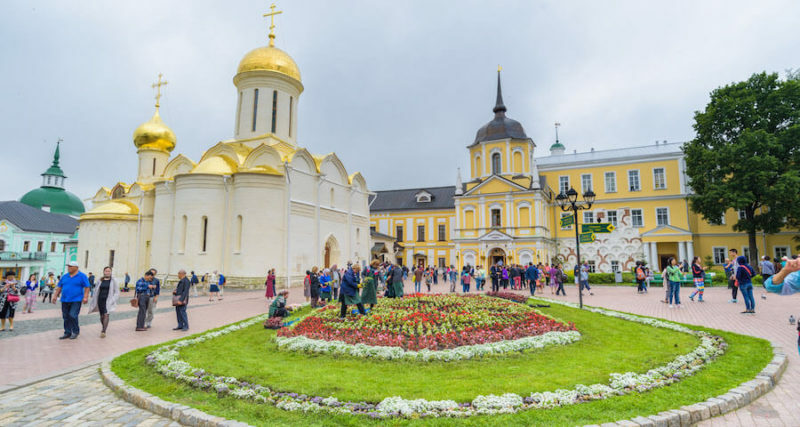 With its chanting, choral music, myrrh aromas, and ornate churches, the Russian Orthodox faith appeals to the subconscious, to the emotional side of our nature, providing relief and hope. The site was blown up and construction began, though the palace never materialized. Eventually, the site was turned into a heated indoor swimming pool and was used for several decades. It wasn’t until 1995 that the Russian Orthodox Church asked the government to allow for the restoration of the original cathedral. The project was approved and a public fund allowed the church to rebuild. These days, Sunday services are a sight to see. There are Russians from all walks of life choosing to attend services there. People who are visiting Russia should go in order to really get a feel, not only for the church in action, but also a better idea of what Russian culture is all about. The rules for attending are fairly simple. You should exit and leave quietly and you don’t need to stay through the entire church service. When it comes to the style of dress, women are expected to wear headscarves and men should not be wearing anything at all on their heads when they enter the church. As long as you are respectful, the church has no problem letting you come and view a service. What Types of Drinks Do Spanish Speaking Nations Enjoy?